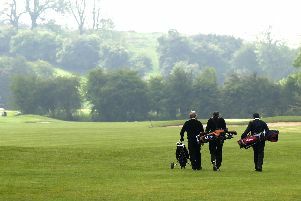 THE EIGHT unions in Yorkshire have declared their line-ups for the 42nd six-man team championship, to be staged at Bingley GC on Sunday. Leeds recently completed the Yorkshire Inter District Union double of league and six-man championship under organiser Mick Fisher’s stewardship. Sheffield captain Richard Hodgkinson will be looking for his side to emulate Leeds’s achievement at senior level after taking the league title in dramatic fashion on Sunday. Sheffield’s team will be Nathan Fell, Jordan Perry, Nick Poppleton, Neil Stones, Jamie Harrison and Matt Evans. Leeds’s team is Rob Wardle, Chris Green, Tom North, Ben Hutchinson, Simon Coumbe and Dan Bradbury. Bradford’s team is made up of Dane Bairstow, Rob Malloy, Rob Hillas, Chris Howe, Nigel Colbeck and Andrew Town. York are led by 2014 Yorkshire county champion Julian Taylor, who went so close to retaining his crown at Fulford last month before placing second to Jamie Bower. Taylor is joined in the York team by Martin Brown, James Walker, James Cass, Jamie Miller and David Hague. Teesside’s line-up is Tom Smith, Adam Bates, Brad Hildreth, Michael Hay, Ryan Barrett-Elliott and Nat Poole while East Riding are represented by Ryan Gray, Nick Jones, Alan Wright, James Woodhead, Andy Woodhead and Nick Raybould. Halifax-Huddersfield will be looking to make ends for failing to take advantage of Sheffield’s final-day performance when they were held to an 18-18 tie by outgoing champions York. A win at Bradford would have given Halifax-Huddersfield the title and the men charged with healing that wound are Mark Birkett, Chris Lander, Aron Schnacke, Dan Hartley, Jake Hamilton and Elliot Lister. Chris Atkins, Ed Cowan, George Muscroft, Dan P White, Phil Kitching and Josh Bassitt will seek to win the title for Harrogate. Play gets underway at 7am with the afternoon’s play beginning at 12.15pm. All six scores count for each team.